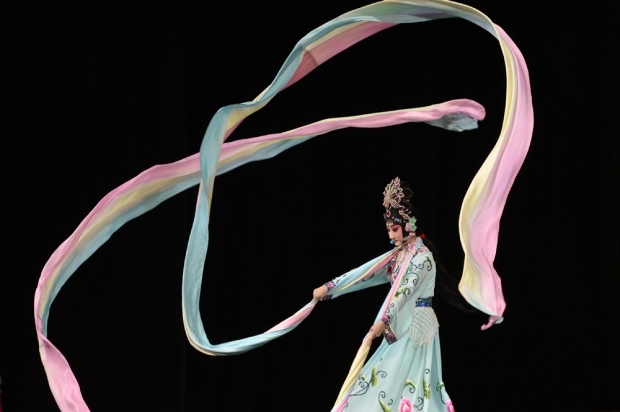 Actress Dou Xiaoxuan performs Peking Opera during a preview for media at the Kennedy Center of the Performing Arts in Washington, D.C. on August 27, 2014. Peking Opera Idol Mei Lanfang May Be Best Remembered for His Overseas Tour of the U.S.
By Sheila Melvin, a Caixin columnist. This article was first published in Caixin. The Peking Opera star Mei Lanfang (1894-1961) is generally acknowledged to have been the greatest performer of female dan roles in the history of his art. He was also a renowned theatrical innovator whose performance style is carried on as the "Mei School." Among the activities held to commemorate the 120th anniversary of his birth was the Jingju Theater Company of Beijing's August tour to New York and Washington led by Mei's 80-year-old son, the dan actor Mei Baojiu. 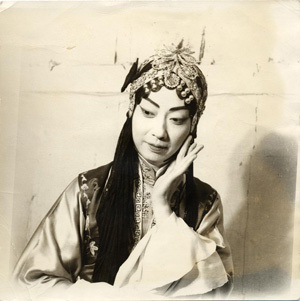 The tour, which included three performances at New York's Koch Theater and two at Washington's Kennedy Center, highlighted Mei's enduring influence on Peking Opera and underscored his lesser-known role as a cultural ambassador whose 1930 U.S. tour was a sensational success. Mei Lanfang and his company of musicians and actors opened their American tour with a scheduled two-week run at New York's 49th Street Theater on February 17, 1930. Designed for a foreign audience, each program consisted of four half-hour excerpts from classic operas, one of which was always a dance selection— "The Heavenly Maiden Scattering Flowers," "Farewell, My Concubine," "The Exorcizing of the Fox Spirit," "The Heroic Maid," "The Drunken Beauty," etc. Audience members were given a thick program that explained the history and stage conventions of Peking Opera and provided plot summaries of the operas; a young Chinese graduate of an American university, Soo Yong, was engaged as emcee to introduce each excerpt. The premiere performance sold out and establishment critics vied to praise Mei Lanfang. "One of the most exciting evenings I've spent in the theater," wrote the New York World's critic. "Mei Lanfang is one of the most extraordinary actors ever seen. Nothing like this has ever been seen in New York." The New York Post said, "He is the most graceful man seen on the New York stage since Nijinsky [the Russian ballet dancer]." The New York Times critic called Mei's acting "as limpid as a forest pool" while the Herald-Tribune declared, "Here is a realization of perfection which is more rare and precious than anything a new world can produce. Our imaginations remain prostrate before its delicacy, grace, and poetry." So many people were left clamoring for tickets that the New York run was extended by three weeks and moved to the larger National Theater. Scalpers sold tickets for six times their face value, and Mei was feted at a banquet attended by 5,000 people who shelled out US$500 per table and US$1000 for balcony seats. When Mei finally left New York to travel on to Chicago, San Francisco, Los Angeles, and Honolulu, rapturous audiences embraced him with equal delight. As the San Francisco Chronicle summed it up near the end of the tour, Mei "has been an ambassador no less than a player and has done more to give America some sympathetic understanding of his race than reams of diplomatic correspondence could do." Mei Lan-fang had to surmount many obstacles to capture his western audience. He was a man playing a part of a woman. He was speaking an incomprehensible language, using a high falsetto voice, singing with a musical accompaniment that most westerners have been reared to regard as grotesque. He appeared on a brightly lighted stage, without the relief of softer tones and changing illuminations. He was acting plays utterly foreign in construction and subject matter. What, then, was the secret of his popularity? Carter suggests it was "a quality of universality" in Mei's work and also his "personal charm" and that of the Columbia University-educated scholar, educator (and, later, diplomat) P.C. Chang who served as Mei's interpreter. This certainly seems true—and other critics who praised Mei's performance made both points. But, what also stands out in reading about Mei's tour are the years of effort that he and others put into preparing for it, the dedicated support of his American sponsors, and Mei's unwavering commitment to promoting both Peking Opera and culture from China more generally. Long before attempting an overseas tour, Mei performed regularly for foreign audiences in Beijing, perhaps starting with a well-received 1915 staging of "Chang E Flies to the Moon" for the American College Club. In 1919, United States Minister to China Paul Reinsch suggested at his own farewell banquet—he resigned to protest the unfair treatment of China at the Treaty of Versailles—that Mei should tour the United States. Mei's friend, the scholar and librettist Qi Rushan, started questioning both foreign residents of Beijing and Chinese who had studied overseas about their own favorite operas and their opinions as to what would most please a foreign audience. After interviewing more than a thousand (!) such people over a period of years, he put together a tentative program list. Mei, meanwhile, continued performing for foreign residents of and visitors to Beijing—in the 1920s, it was said that Western tourists wanted to see three things in China: the Great Wall, the Temple of Heaven, and Mei Lanfang. Mei hosted at least 80 events during the 1920s and entertained more than 6,000 guests from around the world. Qi helped to make sure that when "foreign friends" came to Mei's house "Every object was in pure, ancient Chinese style. The dishes and refreshments were all extremely elegant; cups and plates and all embellishments in the room, every square inch was in Chinese style... All the paintings hung had to be ink landscape paintings... because I could take advantage of them to explain Chinese theater... All the energy expended [on these occasions], the time, the money, cannot be counted." New York's China Institute was Mei's U.S. partner and it undertook its own active public relations campaign, signing on more than 200 tour sponsors, among them former President Woodrow Wilson's widow Edith and Hollywood stars Douglas Fairbanks and Mary Pickford. Qi also managed to secure financial backing from the Kuomintang's Minister of Education Li Shiceng—with whom he had participated in anarchist study groups years earlier in France—after assuring him that cultural exchange was the aim of the trip, rather than profit. During the course of their preparations, Mei and Qi had figured out that the thing Westerners most craved when it came to China was "authenticity" so they catered to this desire, decorating the theater lobbies with Chinese lanterns and dressing the ushers in Chinese-style clothing. In the program, they emphasized the ancient nature of Chinese drama—neglecting to note that Peking Opera was relatively new, dating to around 1790—and allowed critics to believe that they were seeing something "going back almost thirty centuries perhaps" or dating to "the Chou dynasty of 400 BC." For Mr. Mei, although he is recognized as a genius, is not regarded in essentials as an exception in kind to the general run of his countrymen. He is appreciated not because he is "really like an American," but because he is truly Chinese. He has even caused us to question our own dramatic forms and our manners. And he has led many of us to respect the Chinese and their civilization in a way that no amount of preaching has ever done. When Mei sailed home from America, everyone was certain he'd be back—but that was not to be. Instead, we are left with the record of a cultural exchange visit that has yet to be surpassed and which any of us who care about these things would do well to study.